Members of the First Presidency and Quorum of the Twelve Apostles often speak about using technology and social media to hasten the work of salvation. 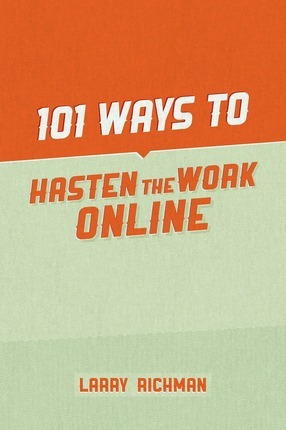 This book gives Latter-day Saints 101 easy, practical ways to hasten the work online. LARRY RICHMAN is an online marketing professional who has worked for the Church directing LDS.org, social media, project management, product management, and publishing. I was looking for ways to help my kids catch the vision of how to really use Instagram or Facebook in powerful ways. I was thrilled to see other avenues listed too. I've decided that this book will now be required reading in my home for every child before they can set up a social media account (that's 8 children!) I also plan to have my kids initial the book next to each idea that they use--with the goal that as a family we can eventually work through the entire list. When it comes to trying to "be a light" this book moves the reader from a flashlight effect toward more of a floodlight. A quick read, 101 Ways to Hasten the Work Online is a GREAT way for people looking for ideas to start or "hasten" their online efforts to share their beliefs. In addition to literally 101 ideas on how to be engaged, the book does a fantastic job of setting the stage and explaining 1) what social media is, 2) why it's important, and 3) how to be yourself while being a source for good online. I can't wait to start implementing some of the ideas from the book in addition to ideas that came to mind while reading. A must-read for any #Christian wanting to share the good news of their faith online. I enjoyed this straight-forward book. Lots of easy ideas of things you can do online to share the gospel and "hasten the work." Easy to read and good, substantial things you can do. A true classic in learning how to share the Gospel online! This book is great for all those individuals that want to heed counsel from our leaders to "hasten the work." The beauty of these tips is in the simplicity which which Brother Larry Richman relays them--his explanations are complete yet succinct, and he provides ideas on how, in just minutes a day, you can make a difference. I also love how the ideas he presents do not seem forced; rather, they fit into things I regularly do online and the "fear factor" of missionary work is taken out of the equation. I highly recommend this book to those who want to flood the earth with the goodness and light of the Gospel! This is a great book for anyone, any age, wondering where to start when it comes to sharing the gospel through social media. Larry's tips are easy to understand and include plenty of pictures for easy reference. If you aren't familiar with repins, hashtags or Instagram, this book gives a great starting point. It also spurs a lot of ideas for those who already live in a hyperconnected world. Highly recommended.